Is everything is ready for the show… except you? If you are anything like me, you have focused so heavily on your preparations for the show that you have not yet thought of yourself. Now the show is just around the corner and you need to get yourself ready for traveling. No need to panic! 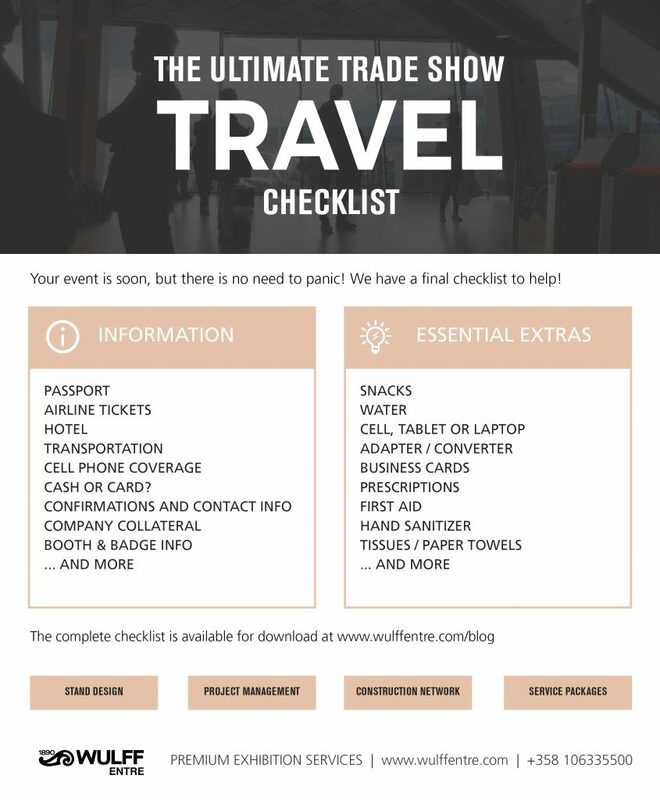 We have created a trade show travel checklist to help you prepare for your trip. 14 Important To-Dos and Arrangements + 14 Essential Extras! To download, just complete this short form. Once submitted, simply scroll back down to click on the link to download. Our Monthly Newsletter will keep you informed about upcoming trade shows, tips, deadlines, and company news. You can change your mind at any time by clicking the unsubscribe link in the footer of any email you receive from us. I'm in, keep me in the loop!